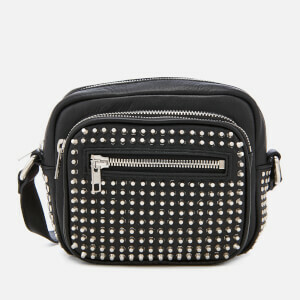 Women's mini leather bowler bag from Alexander Wang. 45% smaller than the classic 'Rockie' design, the mini 'Rockie' is crafted from pebbled lambskin and features a concealed zip fastening hidden beneath a side fold, and a top zip fastening that opens to reveal a lined internal with single zip and slip pockets for extra storage. The small bag is complete with two rolled top handles, a detachable shoulder strap and rose gold hardware throughout, including three rows of protective studs to the base. Dimensions: H: 13cm x W: 20cm x D: 8cm.